This post URGENT: Gold Announcement @ 2PM appeared first on Daily Reckoning. Do you recognize this chart? Hint: This is one of my favorite areas of the market. And it’s an opportunity we’ve talked a lot about here at The Daily Edge. If you correctly identified this as a price chart for gold, give yourself a pat on the back. Even better, if you’re actually invested in gold, you’re doing even better. Because the higher the price for gold, the more wealth you’re accumulating. Today, I want to tell you about the biggest catalyst for gold that is happening this afternoon. You definitely won’t want to miss this opportunity! It’s been a tough road for investors over the last four months. Ever since stocks started pulling back in October, confidence in the market has been weak. But don’t tell that to gold investors. If you look at the chart above, you’ll see that while the rest of the market was turning lower, the price for an ounce of gold actually increased. In other words, gold was a great way to protect your wealth during an uncertain time in the market. Which is exactly what precious metals are supposed to do. 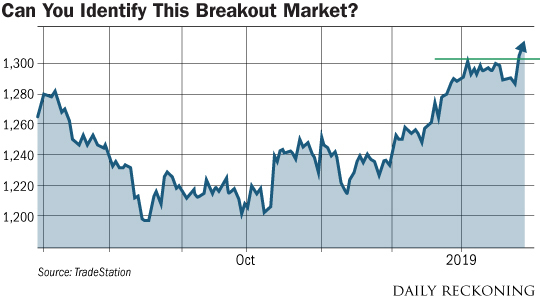 Just this week, gold broke even higher, adding to investors gains. A big part of the reason gold is now trending higher is because of the new theme the Fed has been communicating to markets. The theme revolves around the Fed’s balance sheet of roughly $4 trillion in treasuries and mortgage backed securities. Since October of 2017, the Fed has been slowly reducing the amount of these securities held. And this “runoff” in the Fed’s balance sheet has naturally helped to prop up market interest rates. Jerome Powell spooked investors last December when he told us that the Fed’s balance sheet “runoff” would be on autopilot for the foreseeable future. That told investors that the Fed would continue this subtle force driving interest rates higher, even if the economy weakened. Of course, in hindsight this was a poor choice of words. Using the term “autopilot” caused investors to panic and drove stocks sharply lower in December. Unofficially, different members of the Federal Open Market Committee have offered statements to indicate that the Fed will not be on autopilot when it comes to letting its bonds mature. In other words, the Fed is not likely to continue to force market interest rates higher by allowing this “autopilot” runoff in its balance sheet. Today, I expect the Fed to make this more flexible policy “official” as Chairman Jerome Powell releases a new statement on interest rates and then hosts a press conference shortly after. As an investor, you should be looking for the best ways to profit from this shift in perspective. And there are few better ways to profit from this Fed announcement than the gold market. 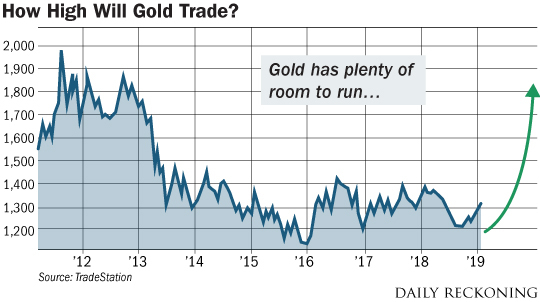 In the past, we’ve talked about how the gold market is tied directly to U.S. interest rates. Lower interest rates generally lead to a weak dollar. This is because fewer people want to hold U.S. dollars if they’re receiving less interest from their cash. When the dollar weakens, gold trades higher. This is a simple truth because it takes more “weak” dollars to buy an ounce of gold. So with the dollar now starting to weaken, it’s no wonder that gold has been moving higher. When the Fed releases its announcement today, I don’t expect any change to the Fed’s target short-term rate. But the announcement will certainly include information on the Fed’s balance sheet of $4 trillion in bonds. And that information will have a big effect on long-term market interest rates. With gold already breaking out, any official statement that pressures interest rates should drive the price of gold sharply higher. And as you can see in the chart below, gold has a lot of room to run before catching up to where it was trading a few years ago. While I recommend always having a portion of your wealth in gold, there are times when it makes sense to add extra exposure to precious metals. This way, you can build your wealth by taking advantage of a sharp increase in the price of gold. Whether you buy shares of the SPDR Gold Trust (GLD), add extra physical gold to your vault, take a long position in a gold futures contract, or even pick up shares of precious metal mining companies, make sure that you act quickly! Because once the Fed makes its policy official this afternoon, I expect gold prices to rally sharply. You may not see a golden opportunity of this magnitude for the rest of the year! The post URGENT: Gold Announcement @ 2PM appeared first on Daily Reckoning.